Twining’s Chai Tea is a good choice if you’re a connoisseur of chai teas, or if you’re just looking for a tasty de-caffeinated tea. While most people think of hot drinks with the word “K-cup”, this chai tea also tastes great on ice, making it a strong choice for any season. If you have a sweet tooth, consider also trying it with a bit of sugar (or honey). Or if you prefer your chai on the creamier side (as it’s traditionally served) then try adding a bit of milk to it. 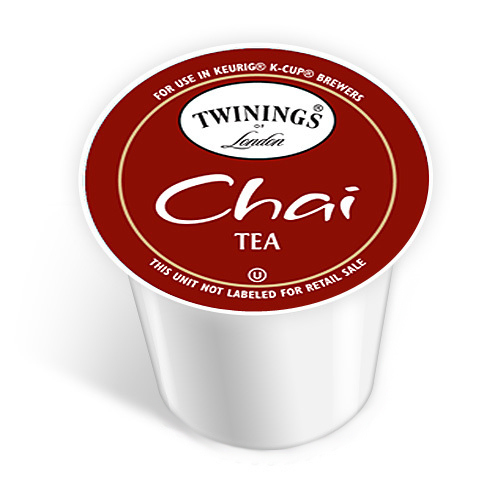 Of all the K-cup chai teas out there, this one is definitely in the top 5.